I had a wonderful birthday last weekend, and now I have a bunch of Thank You cards to make. Here's one of them! Stunning card. Love the image and the paper is beautiful. I soooo love this card. Simple, yet elegant. I love monochromatic cards. This is very pretty Cindy! 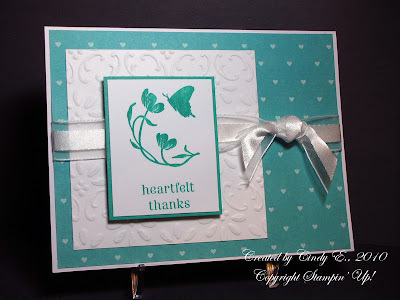 I love how this card is so simple but pretty too! I like everything about it.